Strawberry blond henna hair dye is very light red. Harvest Moon pure strawberry blond henna hair dye is our lightest natural red. It is great to ad a small amount of red or liven up natural red hair that has faded from the sun or worse going gray from getting older. Ingredients – 100% Pure Henna. Apply to clean wet or damp hair for 1 hour. If you want an auburn effect and you have all white hair, you might want to consider our copper brown (copper top) with a small amount of indigo mixed in. The more indigo you ad the darker it will get. If you have dark brown hair or lighter you can create auburn effects. If you have brown hair with white strands you can use pure henna to give you natural red highlights. Natural red heads do not have to do root touch ups, simple use in shower when needed! Just be careful with the hands and feet! Standing in henna or leaving it on your hands will stain you for a week. Do not forget your gloves! 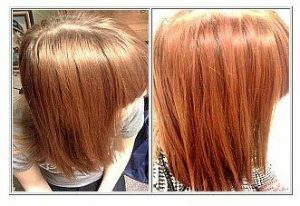 Natural red head freshens up natural red hair using Harvest Moon henna hair dye and the results are stunning.